Richard Dawkins is a frequent visitor to the Bay Area, often stopping at Kepler's to sign books, or speaking at schools (today he taught evolutionary theory to the students at Nueva). 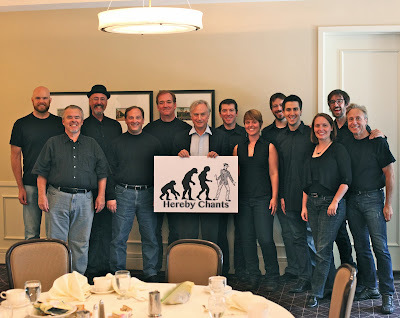 In 2009, while he was here for a book tour for Greatest Show on Earth, I hosted a fundraiser for his foundation, for which I organized the first ever atheist a cappella group from among singers I know who tire of crooning about saviors and magical births. Having read Dawkins' book Climbing Mount Improbable, we called ourselves Hereby Chants.